The CIA Misapplies FOIA Exemptions to Continue its Covert Attack on Mandatory Declassification Review. And Why it Matters. …If you’re in the Security-Cleared Caste, that is. 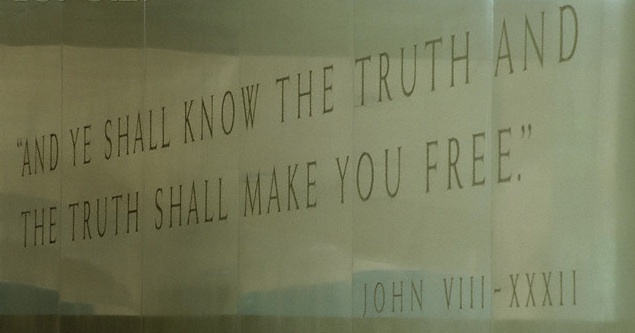 Inscribed at CIA Headquarters. On Friday September 23, 2011, the Central Intelligence Agency snuck two pages into the Federal Register –without a notice for public comment. 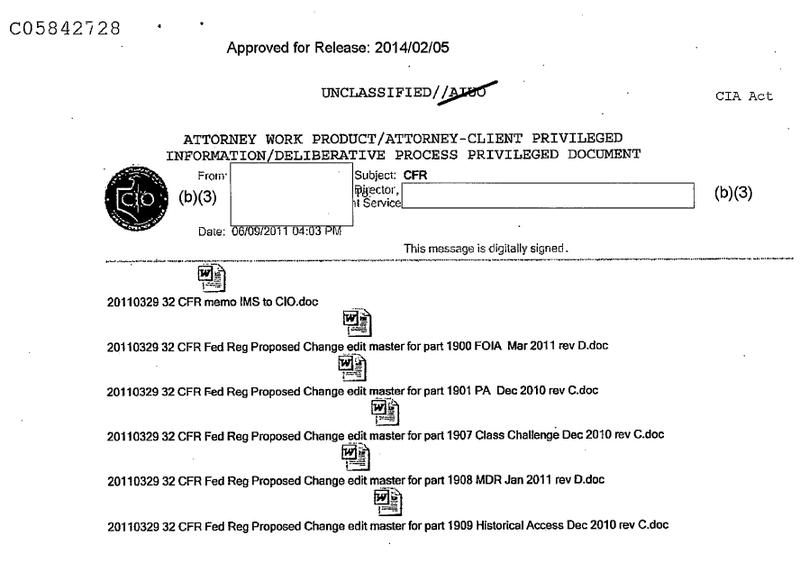 These two pages allowed the CIA –overnight, without informing anyone– to decree that declassification reviews would now cost requesters up to $72 per hour, even if no information is found or released. To even submit a request –again, even if no documents are released– the public would have to agree to pay a minimum of $15. Joseph W. Lambert, Director of CIA Information Management Services, who signed the CIA’s attack on MDR. 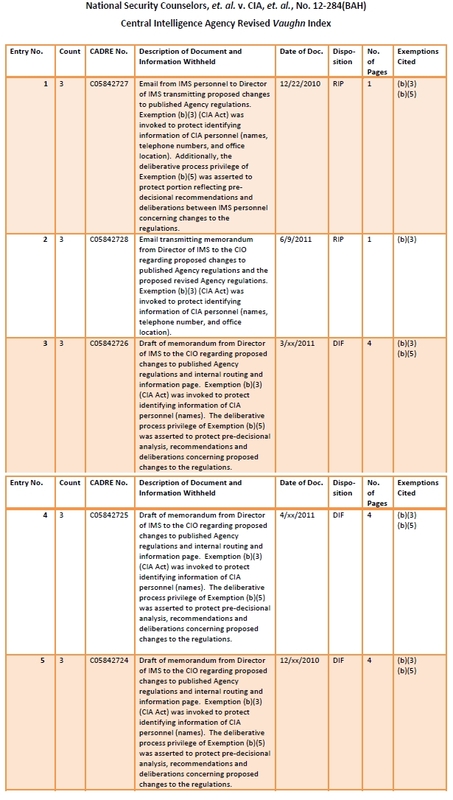 The Agency made this change to price the public out of submitting Mandatory Declassification Review requests because it wanted to avoid the independent accountability and oversight that the Mandatory Declassification Review process provides. Unlike the Freedom of Information Act, adverse MDR responses are subject to review by the Interagency Security Classification Appeals Panel (ISCAP), which regularly overturns CIA denials. According to the US Information Security Oversight Office, ISCAP officials have overruled agency classification decisions more than 70 percent of the time since 1996. 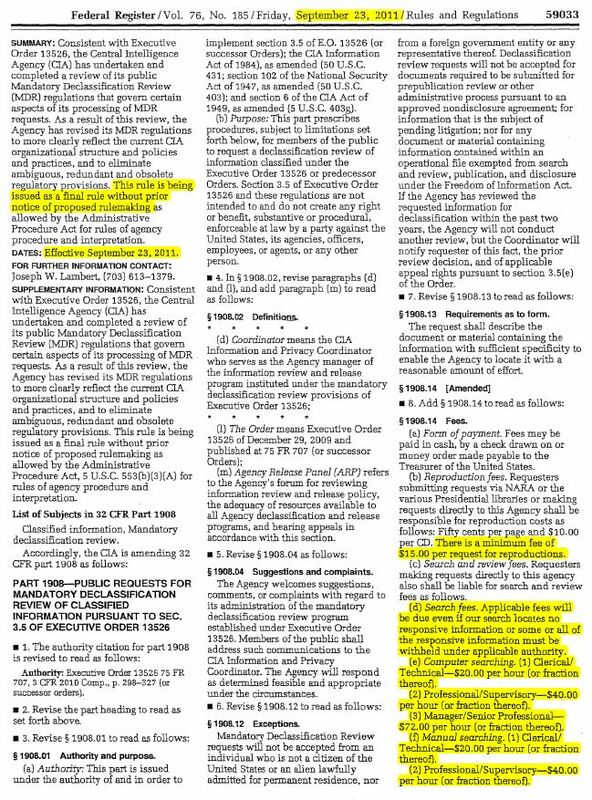 Because the CIA, by all appearances, resents that the public can turn to an independent panel to question and overturn its dubious classification decisions, the Agency is attempting to charge outrageous fees to deter citizens from requesting information. The previous Agency regulations said MDR review fees must mirror FOIA fees, a much fairer and cheaper fee structure. …A new era of open government. What a difference over a year makes. The Agency responded that an unspecified amount of “material” was located and withheld under an (illegally) unspecified b(3) statute and under the b(5) “withhold it because you want to” predecisional exemption. Of course, we appealed. Then, this week we got another bizarre response from the Agency. The Agency stated that litigation about the documents by another party had concluded. Strangely, the Agency also changed the justification it used to withhold the documents from b(3) and b(5) (predecisional) to b(3) and b(1) (National Security)! How could these conceivably harm US National Security? Not to mention none are marked with classification designations. The list of titles of the “material” withheld shows none of the documents are classified, and that none could conceivably “cause harm” to US National Security. The CIA’s pernicious behavior was even more evident when the National Security Archive found the “other party” that was litigating these documents’ release. It was the above-mentioned Kel McClanahan. He passed along the Vaughn Index1 created in response to his litigation. According to the Vaughn index in McClanahan’s court case, the documents in question were withheld under b(5) and b(3) exemptions. 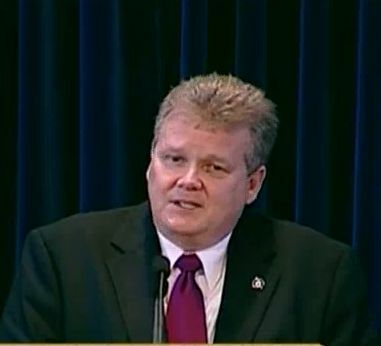 McClanahan told me that the Agency argued vociferously in court that the release of documents on why the Agency changed its MDR fee structure would have a “chilling effect” on Agency morale, and thus must be withheld under “predecisional” exemption 5. An argument that the Agency bizarrely dropped in my case. McClanahan’s Vaughn index shows that when dealing with him, the agency did not evoke the b(1) National Security exemption. And according to the Vaughn index, only CIA employee names, office locations, and phone numbers needed to be redacted. In short, the Agency either sloppily applied its exemptions to hide why it changed its MDR fees; arbitrarily applied its exemptions to hide why it changed its MDR fees; or both. The result is that a policy change that should have been explained and debated in public in the first place was not. And after the public used to last resort of the Freedom of Information Act to attempt to discover what happened, the Agency abused that law to hide its policy change as well. The Agency’s Information and Privacy Coordinator Michelle Meeks signed the denial letter. She was chosen to sit on the US government’s FOIA Advisory Committee, a committee established to “to foster dialog between the Administration and the requester community, solicit public comments, and develop consensus recommendations for improving FOIA administration and proactive disclosures.” I planned to ask her about here agency’s new, retrograde declassification fees at the Advisory Committee’s first meeting, but she did not attend. Likewise, the National Security Archive brought our concerns to the White House, to the Information Security Oversight Office responsible for “the oversight of the Government-wide security classification,” and to the Public Interest Declassification Board established “to promote the fullest possible public access to a thorough, accurate, and reliable documentary record of significant U.S. national security decisions and activities.” All demurred, unwilling or unable to curtail the CIA’s anti-transparency pivot. In the end, the lack of oversight that allowed the CIA’s covert attack on Mandatory Declassification Review is endemic of the lack of oversight of the Agency overall. 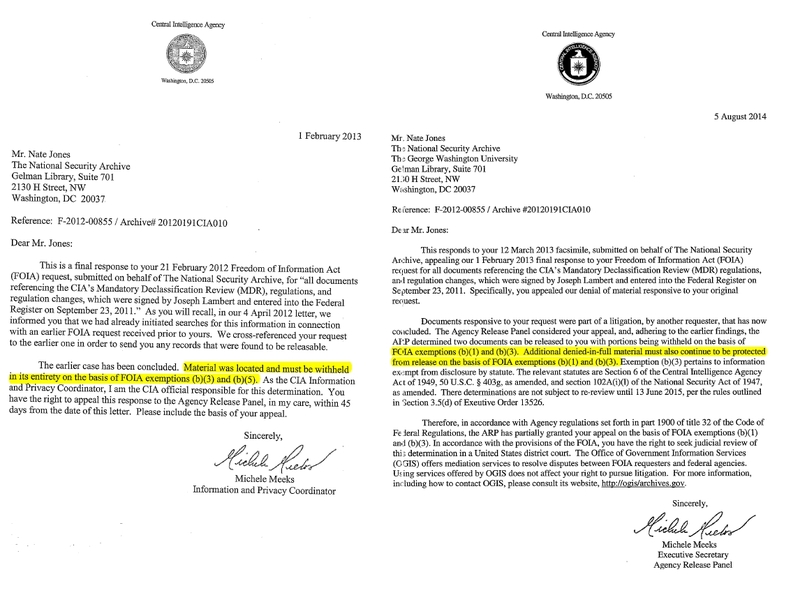 When an agency is allowed to secretly change its processes to price out members of the public who request that previously secret information be declassified, it is no surprise that it is also allowed to ignore requirements to publish budget information, to install email requesting runarounds that would make Joseph Heller sigh, to extrajudicially assassinate Americans oversees (including an innocent sixteen-year-old), to establish black torture sites, to spy of the Senate staffers writing a report on CIA torture, and to then decide, itself, which portions of the Senate report on the CIA’s torture the public should be allowed to see. If the government officials charged with overseeing the Central Intelligence Agency are unable or unwilling to force easy policy corrections, such as not secretly attempting to price out Declassification Reviews, there is no reason to hope that Agency overseers are capable or willing to prevent the CIA from committing its much more horrendous activities. The CIA is just, like, CLASSIFY ALL THE THINGS!! !